The ladies have nearly completed their quilt tops now. The next meeting is in a couple of weeks and I will teach them how to hand quilt and also a quick lesson in machine quilting. It will be their choice how to finish them and will probably depend on whether or not their machine does a good job of machine quilting. The are already talking about the next class and what they can do next. My little girls have completed their quilt tops this past Thursday by tying them with yard during class. It was a little difficult for some of them with their delicate hands but with my help and a couple of parents, we managed to get them all tied. The girls would make the knots after the adults had pulled through the yard. I am really proud of them as their projects all look pretty good. Their colors were amazing as well. Next week, I will teach them how to bind those quilts. They will probably need a little parent help on that step. They are all so excited to start using them. BTW, I have their parents permission to put their pictures on the blog site. I had three ten year old girls here for my kids quilting class. One of the parents stayed and she had her 7 year old with her. The 7 year old was so enthusiastic just watching her sister that her mom signed her up for the class as well. I now have 4 kids. I taught them how to use the foot pedal, thread the machine, sew along the lines on paper without the thread and then we worked on 1/4 inch seams. They all did very well, except for the threading of the machine. I guess their parents can help them with that. I had a bin of hundreds of precut 6 inch squares. The kids picked out (48) squares that they really liked and thought went together. A couple of the girls really had an eye for the color. I find it amazing even at this young age that you either have it or you don't. It can be learned, but it is truly a gift. They then spread out their square and I asked them if there were any squares that they thought did not belong. They did well with this exercise with a little guidance. I didn't want to discourage them too much with their choices so we only dealt with the obvious ones. Their homework is to keep practicing on the machine and their 1/4 inch seams. 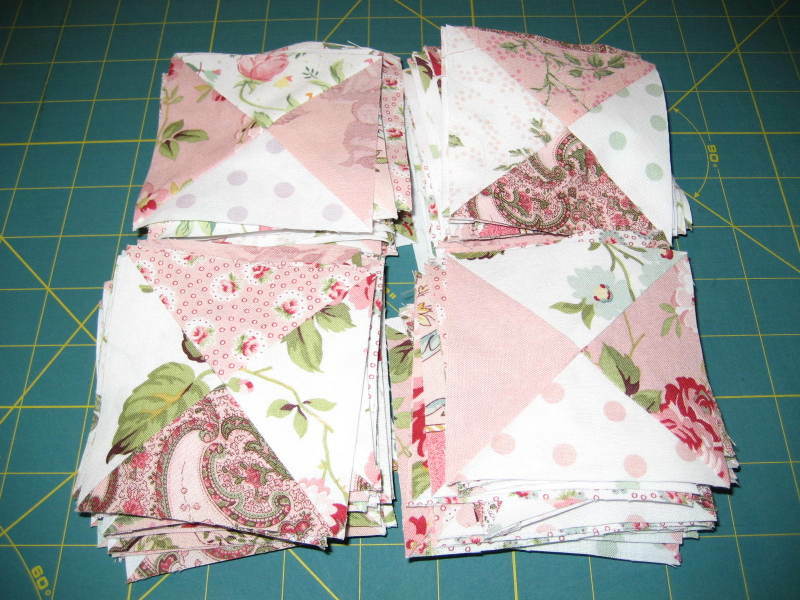 When they feel confident with their seams, they can pair up all of the squares. Next week we will put make eight rows of six blocks and then start putting them together. I will try to get some pictures of them working without their pretty faces of course. I don't think that the parents would appreciate that very much. 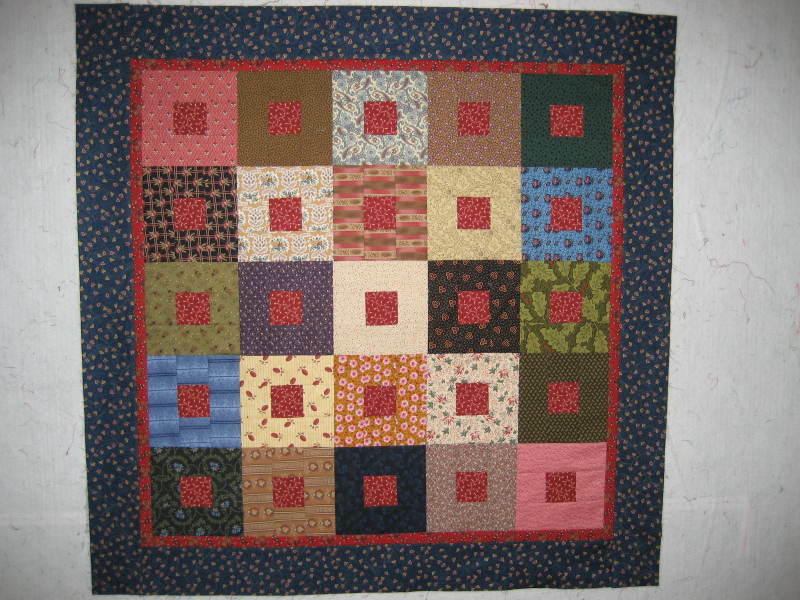 I had the second class yesterday for my beginner quilting class. I have nine students and everyone successfully completed their blocks. We spent the class time arranging the blocks so that it was pleasing to the eye. In class they worked on sewing together the blocks into rows and adding rows together. 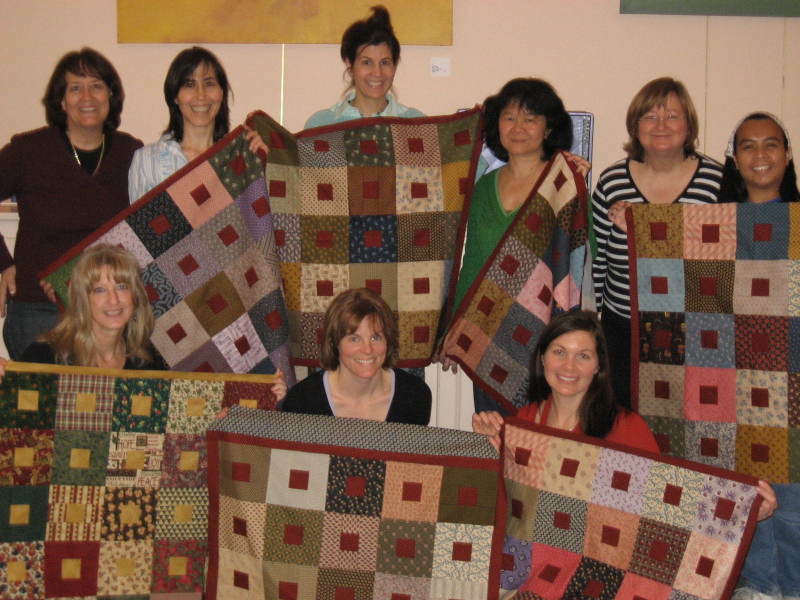 The students are very motivated and really enjoying the art of quilting. 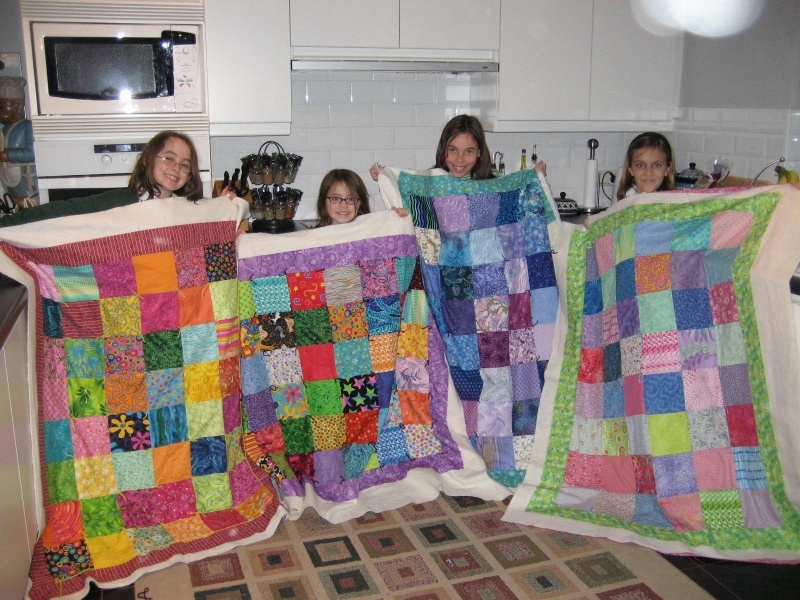 Beginning Thursday for four weeks, I have four little girls (Grade 4) coming to the house for quilting classes. I have a million 5" squares. I will let them choose the squares and then teach them how to use the machine and stitch the squares together. It will be a blast and I will have a couple of parents staying to help supervise. I will demonstrate rotary cutting and maybe let them try it with my supervision, but it will be much easier to have them choose the already cut blocks. 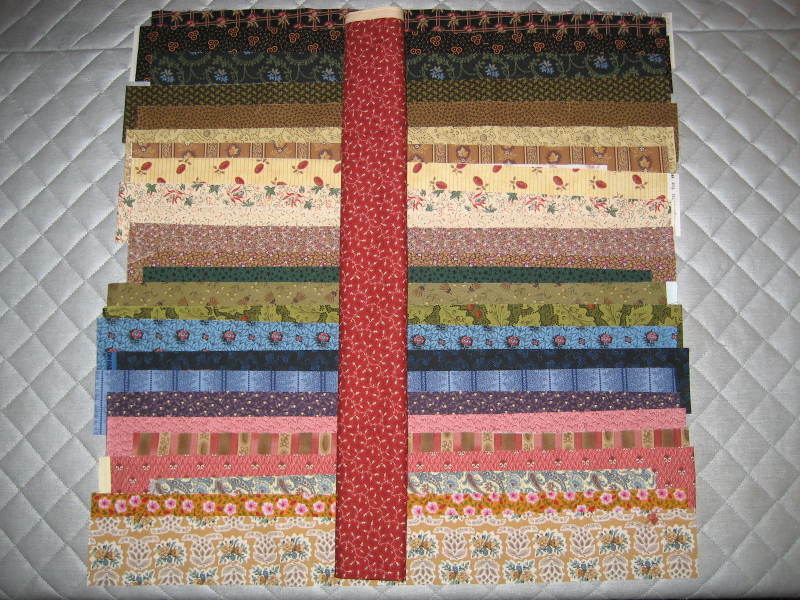 Well, I have been madly working on the Carolina Crossroads quilt trying to get all of the blocks finished. I have finished the broken dishes (step 5) below. I was on a roll so I proceeded to start putting the pieces together and managed to get all of the Step 6 blocks finished. After completing these items I went to bed last night and dreamed in pink and green. This morning I woke up early and put together all of the Step 7 blocks. Hurray! 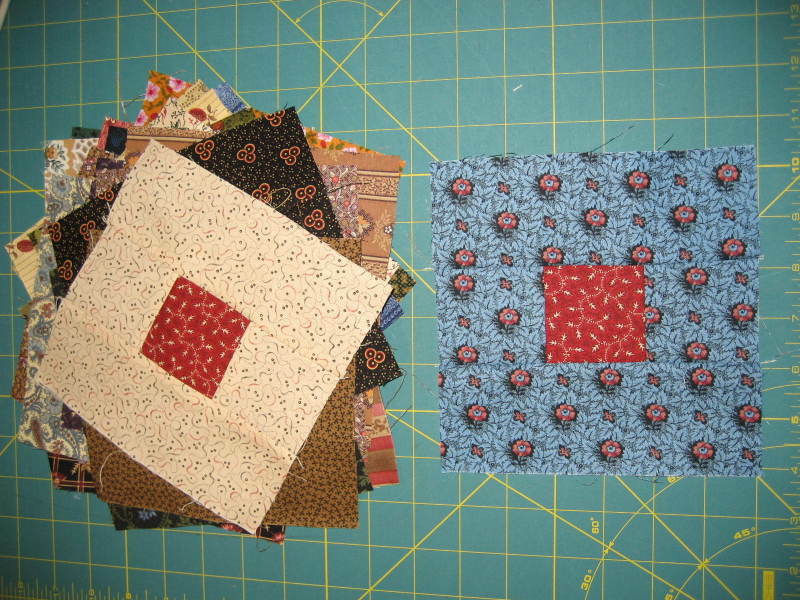 The blocks are all done, now it is time to put them into a finished quilt. 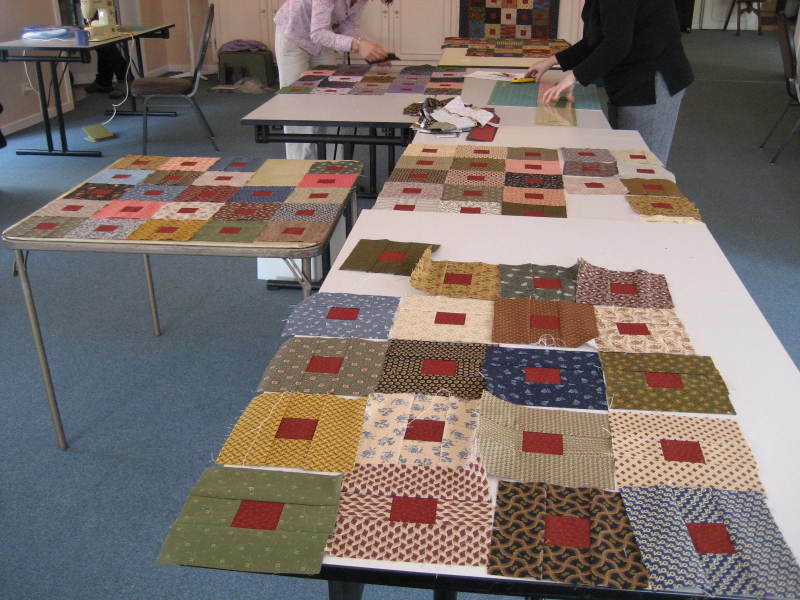 Tomorrow (Monday) I begin my quilting class "All Square" for my beginning quilters. There will be nine students in the class which is probably a good number for beginners. I am giving the students a kit for an additional charge to make the project. There are seven all the same and of course, I have two students that called and requested a 'special' kit. One of them wants Christmas fabrics and the other wants only blue. Of course, it is possible, as they both gave me ample time to put them together. 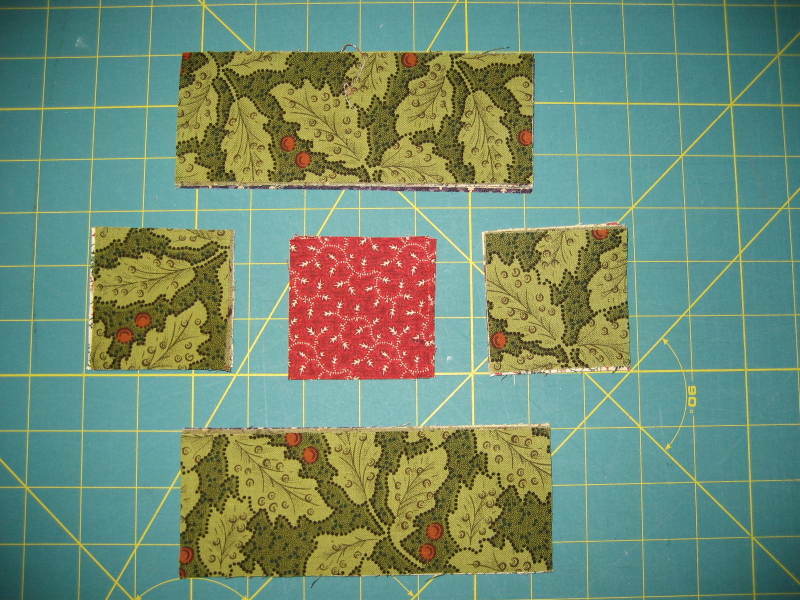 The kits include everything necessary for the entire project including backing, binding and batting. I have cut about 250 different strips for the students to pick out their favorite 25. I will just add the remained of them back to my strip stash. The quilt top is finished and ready to go. I have sign ups for the class on Tuesday and Wednesday at the club in Brussels and hopefully it is a successful class. I will keep you posted. I cut the pieces for the 25 blocks first. Next, I put the blocks together. 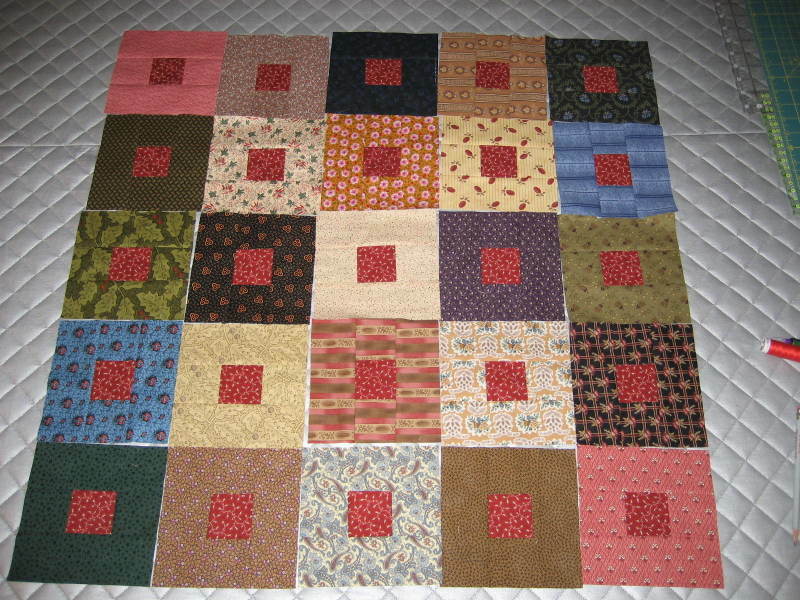 Next, I organized the 25 blocks into a pleasing arrangement. Even when something is scrappy and random, I still have a tendency to balance things and try to be symetrical. I can't help myself. This is the finished quilt top 36" x 36". 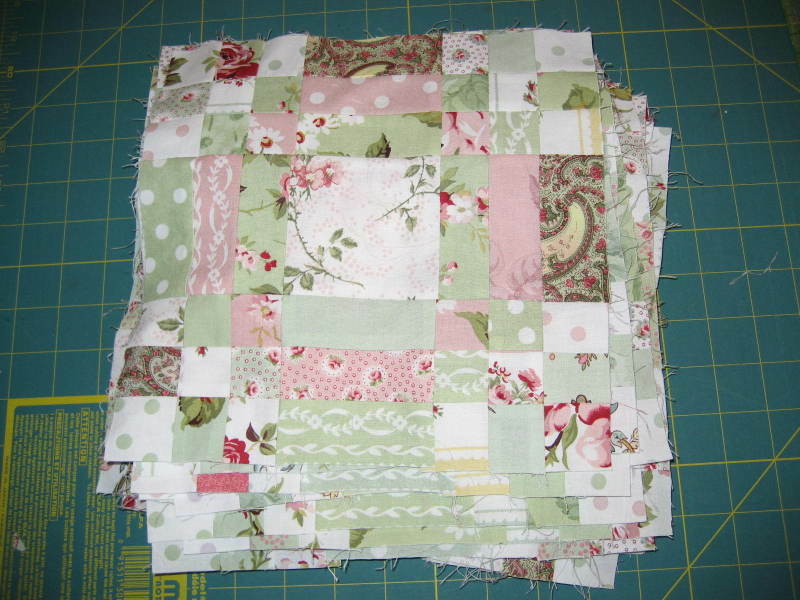 Hopefully, it is a good project to try to hook a bunch of new quilters. I will show you the quilted quilt later when I get that done. I am not in the mood for firing up the big machine today. 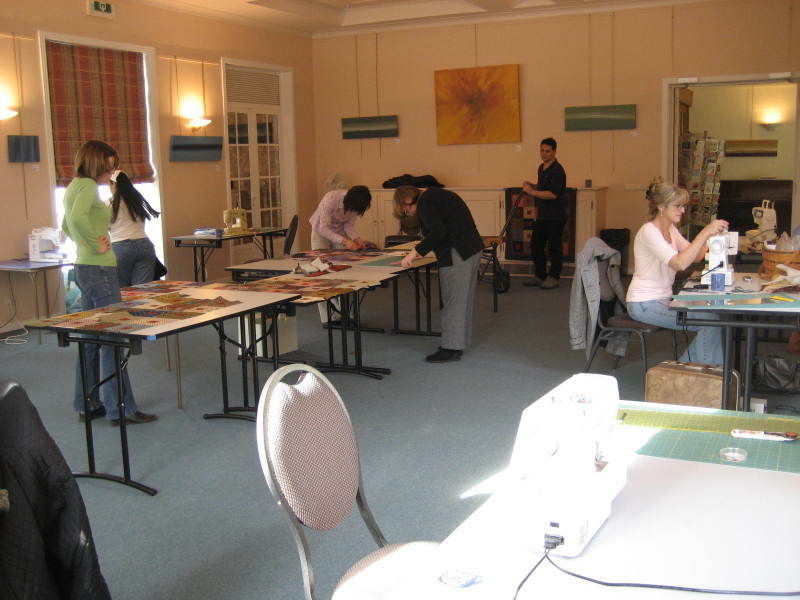 After such a big reception of the Quilt Show at the AWCB clubhouse in Brussels, I was asked to teach a quilting class. After giving it a lot of thought and getting some great ideas from my friend M, I have decided to do a square in a square type wallhanging. 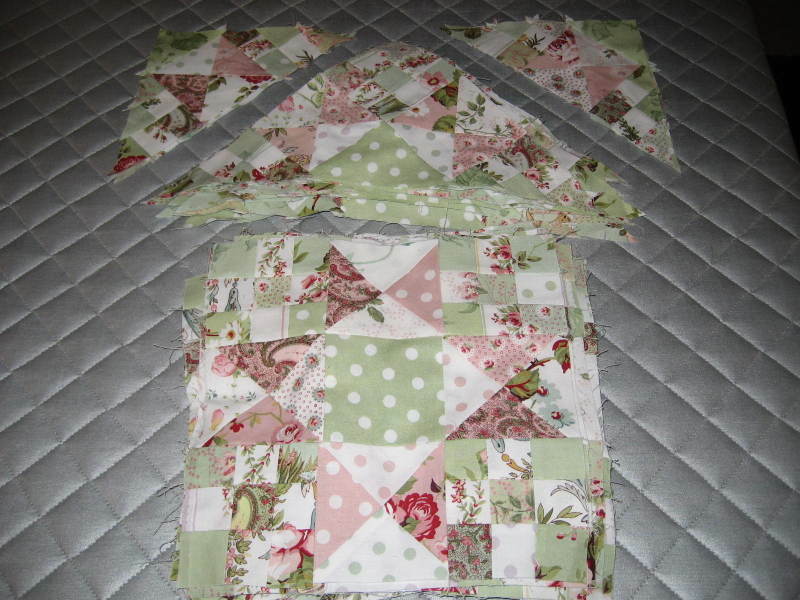 A very easy project for a beginner or the possible hand piecer, and the project should be small enough to finish in the 5 weeks. I will sell the students a kit that will have 25 different strips 2 3/4" wide and 2 red strips 2 1/2" wide (everyone will have the same red). The strips will all be reproduction fabrics because they all go together so well. We can play games with the strips, trade the strips, etc. After they sew the colored strips court house style around the red squares (25), I will have them trim the blocks to the proper size of 6 1/2". After they are all trimmed, we could again play games with the blocks, trade the blocks, etc. 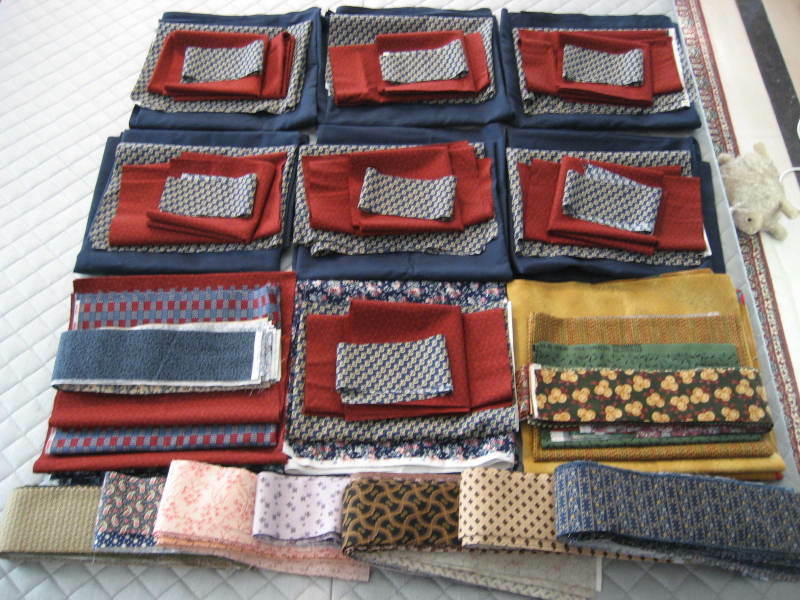 Below is the selection of fabrics I have chosen for my sample. I will show you the complete top when I have it finished.